Day 1 of 365, a photo by Gordon McKinlay on Flickr. Project 365 is a photography challenge. The aim is to take and share a photo every day for a whole year. A good time to start is 01 January as it makes it easy to remember when to finish. I have taken this challenge twice before. In 2007 and 2008 I managed to complete it with only a few stutters along the way. You can see me effort for 2007 here and for 2008 here. Having had a big gap and with lots of new kit available (includling a new iPhone 5S) I think it is time to have another go. In fact having a decent quality phone camera is a major part of my thinking for this year. I always have my phone with me and don’t need to get back home to edit and upload. So here is my first photo. 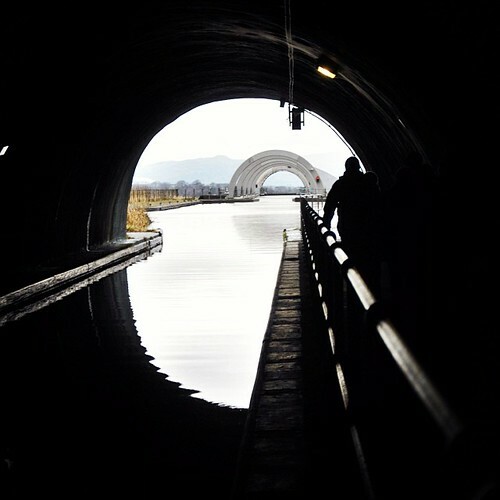 It was taken of the Falkirk Wheel from inside the Roughcastle tunnel on New Years Day 2014. We were out for a family walk as we usually do. It gave me the perfect opportunity to take a few photos before the rain came on. If you are interested in taking the challenge then take a look at a couple of Flickr groups: Project 365, Project 365! Let’s see where the journey takes us in 2014. This entry was posted in Professional and tagged 2014, challenge, Flickr, one a day, photography, project 365 on 2 January, 2014 by Gordon McKinlay.